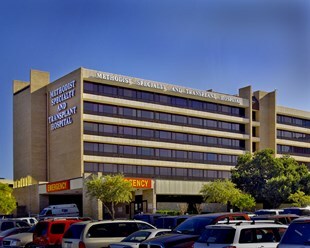 Located in the South Texas Medical Center in San Antonio, Methodist Specialty and Transplant Hospital (MSTH) is licensed for 382 beds. The hospital is widely acclaimed throughout the Southwest for its specialized medical services including heart, kidney, pancreas and liver transplants, as well as latest procedures to treat impotency, incontinence and gastroenteric illnesses. Other specialty areas include emergency care, inpatient rehabilitation, behavioral medicine, bariatric surgery/care and the latest treatments for cancer. The facility also houses a program in which a specially trained team works with law enforcement officers to provide care for survivors of sexual assault. MSTH is home to the Texas Transplant Institute, the busiest kidney transplant program in Texas and among the top 10 in the nation. The program has performed the most live kidney donor transplants in Texas, using minimally invasive laproscopic techniques for most procedures. The heart transplant program is the first Medicare-certified program of its kind in South and Central Texas and is the Medicare-approved site in the region for patients needing long-term assist device therapy. The liver transplant program includes a liver failure clinic that offers a variety of services, including Interferon treatments, chemoembolization and radio frequency ablation procedures. The Methodist Cancer Center is part of the facility, treating all types of cancers with the latest radiation therapies, including the advanced Gamma Knife and CyberKnife. The Center treats cancers of the prostate, head, neck, breast, thyroid, and lung, as well as in gynecologic, liver and brain tumors, lymphomas and sarcomas as well as some non-cancerous conditions and lesions. The hospital has been named by the American Society for Bariatric Surgery as a Bariatric Surgery Center of Excellence in recognition of their program s demonstrated track record of favorable outcomes in bariatric surgery. The hospital owns several medical office buildings in the area with one connected to MSTH.